Nokia has launched the latest C5 handset. The mobile phone comes with new design. The two-tone colour scheme comes in both bold and restrained flavours. The device has a 3.2-inch touch display and now features Wi-Fi, for fast internet access without the need or expense of a data plan. It also features a compass and assisted GPS for use with the latest version of the free Ovi Maps hands-free navigation service, now featuring public transport support and location sharing through social networks. Like many recent Nokias, you can put your most important contacts directly onto the homescreen so you can call, message or chat them up in just two taps. The C5 has a 5-megapixel camera with 4X digital zoom, but no flash. Nokia C5-03 is powered by Symbian^1 (aka. S60 5th edition touch-edition). It measures 105.8 mm x 51.0 mm x 13.8 mm (L x W x H) and weighs 93g – that makes it a similar size to the (imminently) forthcoming C6-01, and quite a bit smaller than the Nokia N8 or Nokia C7. It comes with up to 40MB of user memory and support for MicroSD cards up to 16GB. The talktime is quoted at 11.5 hours for GSM use and 4.5 hours using 3G. Standby time is estimated at 24-25 days. Launching globally at the end of this quarter, the Nokia C5 is expected to retail at around 170 EUR before taxes or operator subsidies. 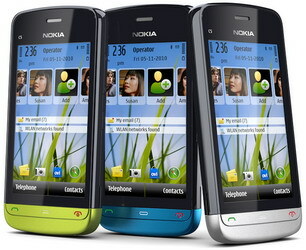 0 comments on "Nokia C5-03 launched"